The visit of the top Soviet leaders left an indelible mark in the hearts of the residents of the Nilgiris in Tamil Nadu. In November 1955, Soviet Prime Minister Bulganin and Communist Party Secretary Khrushchev visited India, it was more a voyage for discovery for the duo. They travelled to Punjab, Bombay, Bangalore, Madras and Calcutta and also made it a point to visit smaller towns and villages. Many historians say this visit heralded a new era of friendship and cooperation between India and the Soviet Union. It was their actions in the small towns that really made the duo legends. In the village of Vadamadurai in Tamil Nadu, Bulganin is believed to have drunk some coconut water in a farm and the place is called ‘Bulganin Thottam’. “They were only in the Nilgiris for a couple of days, but everyone became very curious about Russia after they came,” Raghavan says. The Soviet entourage visited the Singara Tea Estate and had their first taste of tea produced at the estate. Even now in the main house of the estate, there is a framed photograph of Bulganin drinking tea along with a member of the Madhvani family, which has business interests in Uganda and India. 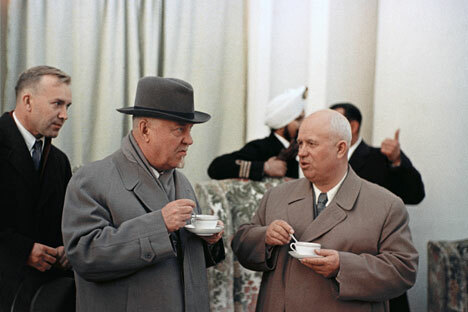 The long visit to India of the two Soviet leaders also created special opportunities for some Indians. Raghavan spoke about how the excited the cooks were at the Ooty Raj Bhavan, the summer residence of the governor of Tamil Nadu, which hosted the Soviet delegation. “It was the first and last time in independent India that the place hosted such high foreign dignitaries,” Raghavan says. Bulganin and Khrushchev also sought the services of the most famous barber in Ooty, N. Varadhan. “The great hair dresser was taken to the Raj Bhavan and asked to cut Bulganin and Khrushchev’s hair,” Raghavan says. “Can you name a single other instance when a barber cut the hair of foreign heads of state?” A report about Varadhan in The Hindu in 2003 paid a rich tribute to the barber who died that year. The report corroborates the story of the Soviet leaders getting their hair cut by the Ooty barber. Varadhan cut the hair of 7 members of the Soviet delegation and was paid Rs 100, a fairly good sum in 1955. The Nilgiri visit led to a deep interest in Russian literature as well, says Raghavan. “There was a lot of demand for Tamil translations of Chekhov’s and Pushkin’s works.” Raghavan went on to study Russian when he moved to Madras to pursue a career as a civil servant. “Those leaders may never have known how much of an impact their trip had in the Nilgiris for more than a generation,” he says. “Even in the early 1980s, when the song Rasputin by Boney M became popular in Ooty, many people associated it with Khrushchev and Bulganin.